Sumatran Fleabane (Conyza sumatrensis) is a dicot weed in the Asteraceae family. In Brazil this weed first evolved multiple resistance (to 2 herbicide sites of action) in 2011 and infests Corn (maize), and Soybean. Multiple resistance has evolved to herbicides in the Groups B/2, and G/9. These particular biotypes are known to have resistance to chlorimuron-ethyl, and glyphosate and they may be cross-resistant to other herbicides in the Groups B/2, and G/9. SANTOS, G., OLIVEIRA JR., R.S., CONSTANTIN, J., FRANCISCHINI, A. C., and OSIPE, J. B.
Greenhouse trials comparing a known susceptible Sumatran Fleabane biotype with this Sumatran Fleabane biotype have been used to confirm resistance. For further information on the tests conducted please contact the local weed scientists that provided this information. There is no record of differences in fitness or competitiveness of these resistant biotypes when compared to that of normal susceptible biotypes. If you have any information pertaining to the fitness of multiple resistant Sumatran Fleabane from Brazil please update the database. The Herbicide Resistance Action Committee, The Weed Science Society of America, and weed scientists in Brazil have been instrumental in providing you this information. Particular thanks is given to Jamil Constantin, Rubem Oliveira, and Gizelly Santos for providing detailed information. Wu HanWen ; Walker, S.. 2004. 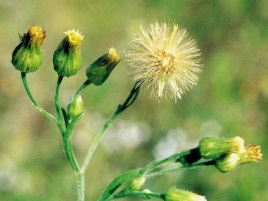 Fleabane biology and control. : 5 - 6. Three Conyza species, flaxleaf fleabane (C. bonariensis), Canadian fleabane (C. canadensis) and tall fleabane (C. sumatrensis), occur in Australia. This paper discusses fleabane biology, summarizes overseas reports of herbicide resistance, and identifies appropriate management strategies (specifically the use of integrated management programme) to prevent or retard herbicide resistance in fleabane..